David introduces us again to a teenaged Artful, who has escaped deportation to Australia and has returned to his regular stomping grounds, sans Fagin and the rest of his gang. As Artful reconnoiters, he finds himself playing knight errant to a young woman who clearly does not belong on these mean streets. Of course, she is Alexandrina Victoria, escaping from the stultifying confines of the palace and her mother. It should come as no surprise to the gentle reader that Artful and the Princess Victoria will be thrust into a dangerous hotbed of vampyres with plans to control Great Britain by transforming the royal princess into one of the hemovores. David has a great deal of fun with his story, introducing familiar characters such as Van Helsing, Dracula, and Springheel Jack, and interweaving them with new ones such as Bram Van Helsing, the son of the famous vampire slayer. The Baker Street Irregulars assist; Fagin plays a pivotal role as yet another blood drinking wraith escaped from Castle Dracula. Bedlam Hospital figures prominently. The author also interjects certain modern sensibilities, giving the Princess Alexandrina Victoria a feminist slant, and making the gentleman in his own right Dodger a young man who appreciates an independent woman. His approach to the prejudices of the day is used to deftly turn a sympathetic corner or two. Interspersed with the fast paced chase to save the Empire, are subtle (and some not so subtle) commentaries on prostitution, poverty, child labor, abusive childrearing, and corruption. Inserting vampires, zombies and such into classical fiction has been a fad in recent years. 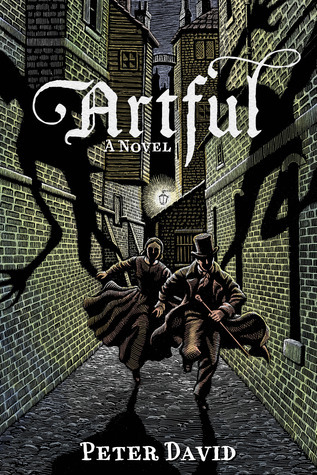 I have to admit I was bored by the Jane Austen and zombies turn, and I picked up Artful expecting a similar disappointment. Instead, I was charmed by the book and by the new Artful Dodger. It is clear that there will be more books with this character. David leaves plenty of hints as to the direction he will be taking. The book is not one to be read as serious literature. It is well written, and has a nice pace and a pleasant plot, and I found myself thoroughly entertained by it. It is perhaps a bit young in its approach, but there is enough skill in the manipulation of what we know from Oliver Twist to make it very readable, even for someone well past the age range of the main characters. If you are a fan of Dickens, or grew up singing the score from Oliver!, or just have a fondness for vampyres and valiant streetsmart heroes saving imperiled princesses in Victorian London, then this is the book for you. I recommend it for a rainy evening, just as dusk is beginning to fall, when that tree by your window is scratching at the glass like a vampire waiting to be invited inside. Curl up with some hot tea, and some toad-in-the-hole, and lose yourself for a few hours in the company of rogues and bogeymen. You won’t regret it.